Ready-to-use compact one-piece fitting for use with most thermoplastic tubing. This fitting is specially designed for low pressure circuits where fast assembly, disassembly and reassembly is important. No special tools are needed for assembly; just insert the tubing until it bottoms. Push-to-Connect is designed to be used with no tube support. Radial claws on the stainless steel grab ring grip the tubing securely to provide retention. The outside diameter of the tubing to be used with the fitting is marked on the release button. 0 to 200ºF at up to 300 psi depending on tubing being used. 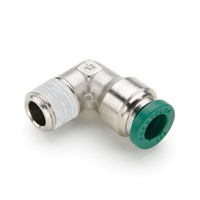 Push-to-Connect fittings have nickel plated brass bodies, a stainless steel grab ring and a high impact release collar to provide long life assurance as well as an attractive appearance.